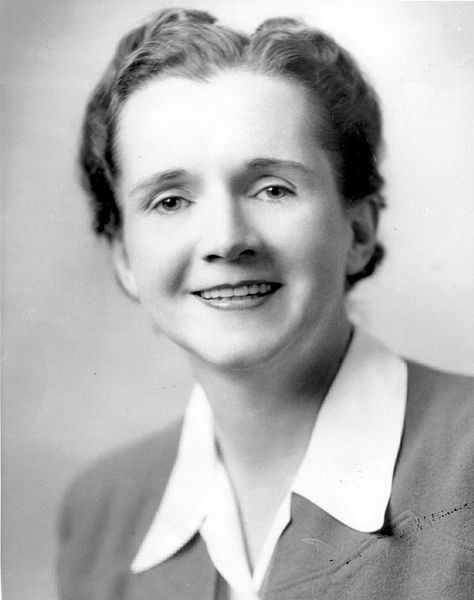 More than 50 years ago a storm erupted when aquatic biologist Rachel Carson published Silent Spring. The book, gathered together from scattered information on pesticides, offered a powerful narrative about the harm chemicals caused people and the environment. 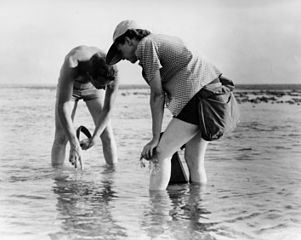 Marine biologists Rachel Carson and Bob Hines conduct research in the Atlantic Ocean, 1952. Photo: United States Fish and Wildlife Service. “Silence” was the price mankind paid for poisoning spring birds with pesticides. Before the book’s publication, one anguished woman wrote to Robert Cushman Murphy, curator emeritus of birds at the American Museum of Natural History. Before the elm trees in her village underwent repeated sprayings for several years, she said, the area teemed with bird life, cardinals, chickadees, woodpeckers and nuthatches. After the DTT applications, she reported in 1958, the neighbourhood’s entire nesting population appeared to consist of one pair of doves and a catbird family. Those stories, and many others on the dangers of pesticides, appeared in Silent Spring. The pesticide industry heaped abuse on the Springdale, Pennsylvania author for her book. According to Linda Lear’s introduction to the 40th anniversary edition of Silent Spring, just released by Houghton Mifflin, the chemical lobby called Carson “a bird and bunny lover,” a woman who kept cats and was therefore clearly suspect. She was a romantic “spinster” who was simply “overwrought about genetics.” The industry spent $250,000 trying to discredit her research, but failed, notes Lear, author of Rachel Carson, The Life of the Author of Silent Spring. Decades later, what is the impact of Silent Spring? Have its lessons been taken to heart? It all depends on where you look. Forty years after the book was published, in Prince Edward Island, nearly 5,000 trout were poisoned in the Wilmont River, a small waterway on the southeast of the Island. It wasn’t the first time a large number of fish have died in rivers in the Canadian province. In 2000, thousands of fish succumbed in the Mount Herbert, Indian and French rivers. In 1999, nearly 10,000 fish died in nine separate incidents. In every instance, pesticides were blamed. The fish in the Indian River, for instance, died from exposure to the insecticides edosulfan and azinphos-methyl, both confined to the restricted use list by the United States’ Environmental Protection Agency. The chemicals flowed past buffer zones from an agricultural field into the river. To readers of Silent Spring, the fish kills are disturbingly familiar. Carson devoted a chapter in her book to several such incidents in New Brunswick’s Miramichi River, one of the world’s great salmon waterways. In 1954, the Canadian government sprayed the forests of the Northwest Miramichi with DDT to prevent a budworm infestation. Within days, Carson reported, dying salmon and brook trout littered the banks of the river. An entire year’s worth of spawning salmon were killed. Elizabeth May, executive director of the Sierra Club of Canada and now leader of Canada’s federal Green Party, recalls she campaigned hard in the 1970s to prevent budworm spraying in Cape Breton, where she’d moved from her home in the U.S.
May remembers reading Carson’s book in Grade 10, in 1970. At the time she was living in Bloomfield, Connecticut, a community that had a lot of mosquitoes and where pesticide fogging wasn’t uncommon. Several years earlier, two of May’s pet sheep mysteriously died, a ghastly scene that traumatized May’s family. The pets’ deaths were sufficiently serious to the May family that they had an autopsy done to find out what killed them. Veterinarians couldn’t find any explanation; they checked the sheep’s stomach contents for poisonous berries and came up negative. After May read Silent Spring and its descriptions of organic phosphate poisoning, she wrote to city officials asking if anything had been sprayed about the time the animals died. It turned out the city had used heptachlor. Remarkably, Silent Spring almost wasn’t published. It was a Canadian resident, Martin Haase, who helped persuade publisher Houghton Mifflin that Carson’s book was a ground-breaking work and that it would gain a wide audience. Haase, who made Chester, Nova Scotia, home but at one time lived in Belmont, Massachusetts, had his own run-in with pesticides that first led to his interest in the subject. In the 1950s, a company came to his house to spray a tree against Dutch elm disease. It was outside Haase’s window and he was near it at the time. When the pesticides drifted in, he immediately became shaky and disoriented. His wife called several doctors, who were unable to diagnose the problem. Finally, a third doctor contacted the tree firm and asked them what the active ingredient had been in the spray. It turned out to be DDT. Haase, who had helped publish a booklet on pesticides by Beatrice Trum Hunter called Gardening Without Poison, said publisher Houghton Mifflin was concerned about publishing Carson’s Silent Spring. Paul Brooks, then an editor with the publishing house, told him the firm was worried Carson’s book would lose money, attract lawsuits and was too controversial. Carson died in 1964 in Silver Spring, Maryland.